Estate Planning — We know that developing an estate plan is not always easy. It can bring up difficult questions and serious concerns. However, you can count on us to guide you through the process with empathy and skill. We draft wills, trusts, advance health care directives and other vital documents. Family Law — Matters involving your children and other family members are very personal and very important. Our law firm understands the emotions involved in divorce, child custody disputes and related matters. We will diligently uphold your parental rights and advocate for your best interests. Probate Law — No one wants to deal with confusing legal requirements when already weighed down by the grief of losing a loved one. Our goal is to make the probate process as simple as possible for you. You can rely on us to offer the compassionate and knowledgeable support you need during this difficult time. Our founding attorneys, Heather S. Mayer and Kristine L. Young, are both Sacramento natives who earned their law degrees from Santa Clara University. Together, they have argued hundreds of law and motion hearings and drafted both complex and simple estate plans. 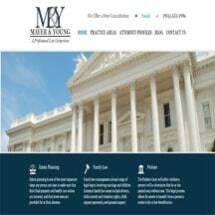 Their mission is to make quality legal representation affordable and accessible to individuals and families throughout the Sacramento community and beyond. To arrange a free initial consultation with one of our lawyers, please call the Gold River office of Mayer & Young, PC, today.